By Sweep - Hazel Burke by Sempronius. Eternal was a very fast juvenile that became champion two-year-old in the U.S., and had enough stamina to get the 1-1/4 mile Brooklyn Handicap at age three. As a sire, he was successful, given his limited book, getting a number of precocious juveniles like himself, including Ariel, who was, like his sire, a stallion that turned out fast two year olds. Quite a few of Eternal's offspring became long-running, hard-knocking handicap winners. He is most often seen in pedigrees today through the influential mare Grey Flight, a grandaughter of Ariel's, who was her dam's sire. His dam was Hazel Burke, by imported Sempronius (winner of the Craven Stakes). 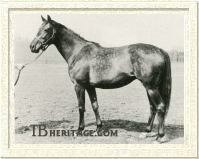 She was a three-year-old in 1911, when racing was suspended almost everywhere but Kentucky and Maryland. At best over a mile, she never broke her maiden, but placed second seven times, and third twice, in twenty-one starts. 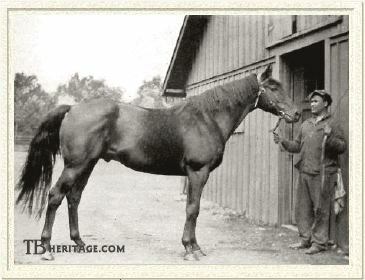 Her unraced Ballot daughter, Forever (1917), was dam of 1928 Belmont Stakes winner Vito (by Xalapa Farm's Negofol). His sire, Sweep, by Ben Brush, was a high-class race horse and twice both leading sire and leading broodmare sire in America. 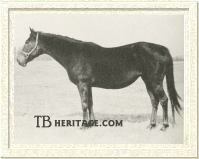 Eternal had the look of a Ben Brush horse, with a long back, well-laid back shoulder, and heavy muscling. Eternal was bred by J.B. Gorham, and sold as a yearling to J.W. McClelland. In his championship juvenile year, he won his first outing by six lengths in a maiden race at Aqueduct. He was next sent out in the 3/4 mile Great American Stakes there, running second to Dunboyne, and beating High Time, who ran third, by eight lengths. At Saratoga he failed to place in the United Hotel Stakes, won by the gelded Billy Kelly, his principal opponent during his juvenile year. Sent out a week later in an allowance purse, he won over some unchallenging opponents, but established a track record for five furlongs in the time of :58-2/5. Despite being lame, he won the six furlong Hopeful Stakes in heavy going at Saratoga, which offered the then richest purse in the U.S. ($30,000), but Billy Kelly, Dunboyne and other good juveniles were not entered, although the future classic winner Sir Barton was in the race, unplaced. He then won an allowance race and the Oakdale Handicap, in the latter carrying an impost of 130 pounds. He won a total of six races that year and, thanks to his Hopeful win, was far and away the leading money winner, with $56,137 (in an era of depressed values), and collected champion laurels, even though Billy Kelly won 14 of his 17 races in his juvenile season (but only $32,039 in total winnings). Eternal was plagued by that unspecified lameness throughout the rest of his career. At age three, he started in Sir Barton's Kentucky Derby as the favorite, but came in at the tail-end of the field, after lying second for the first six furlongs. He went, along with Sir Barton, to the Preakness Stakes next, which, with added monies, became, that year, the richest race for three-year-olds. On a fast track, Eternal was beaten into second by Sir Barton by four lengths; Eternal was beaten again by Sir Barton in the Withers Stakes at Belmont. Eternal's most impressive race at age three was the 9 furlong Brooklyn Handicap, when he beat Purchase, close to Sir Barton as the top three year old of the season, and Questionnaire, by three lengths (receiving 12 pounds from Purchase). In the 10 furlong Saratoga Handicap Eternal (receiving 4 pounds) ran second to Purchase by half a length. Eternal was favored in the 1-1/2 mile Latonia Derby in June, but in heavy going he was eased after leading for ten furlongs, when it became obvious he would not place. His lameness kept him out of training as a four year old, but an attempt was to race him at age five, and he won one race before a complete breakdown, which ended his career on the turf. Eternal was purchased by Edward Simms for his Xalapa stud farm in Paris, Kentucky. Simms had set up his stable with the great English racehorse Prince Palatine as its principal stallion, having p aid $125,000 for him. Prince Palatine proved largely infertile by the time he got to America, although he did get some good producing daughters in the U.S. Simms also had a half-interest in the imported French stallion Negofol, a winner of the Grand Prix du Jockey Club and already noted as the sire of Hourless before he was imported into the U.S.; unfortunately Hourless was his best, and he did not live up to his initial promise as a stallion for his new owners. Eternal was Xalapa's third stallion. He was a consistently good sire, not ever largely bred, and never made the top ten on the sires list, or the top five in sires of juveniles. He did barely make the leading broodmares sire list in 1940, placed 20th, with 25 winners of 65 races--this was the year Many Stings won his big purse handicaps. Eternal had only a few years at Xalapa Stud before Simms inexplicably dispersed all Xalapa bloodstock in 1924. Sold by Fasig-Tipton Co. in New York, Eternal was knocked down to Jerome B. Respess for $29,000, but Xalapa continued to operate, with Eternal as its principal stallion. His best offsrping was ARIEL, a brilliant 2 year old that went wrong after winning his only start at age 3. In the stud Ariel became a successful sire of precocious juveniles; his line led to the great broodmare Grey Flight and her daughter, Misty Morn. Among Eternal's long-running handicap winners was OKAPI, bred at Xalapa in 1930, and raced by Brookmeade Stable, a two-time winner of the Toboggan Handicap and eleven other races in 71 starts. He served as a stallion in Kentucky, Virginia and New Jersey, dying at Trinton Falls Breeding Farm in New Jersey in 1959, still servicing mares at age 29; he got twelve stakes winners. Another Xalapa product, ALETERN (1939, from a My Play mare) was Eternal's most money-winning offspring, with a total of $78,430 in his 42 starts, with 13 wins, including the Potomac and Sheridan Handicaps at age three, the Ben Ali Stakes, Francis Stakes, La Salle Handicap, and Peabody Memorial Handicap at age four, and the rich Suburban Handicap at age five. He had only 29 foals, and one stakes winner. Another long-running Eternal colt was TRINCHERA, winner of 27 races in 76 starts, including the Dallas and Fort Worth Handicaps at age four, and the San Jacinto Handicap at age five. INFINITY (1926, from Polly Pennant) had 109 starts, winning 32 of them, one a stakes--the Consolation Claiming Stakes at age two; he was another bust as a stallion, with under 30 foals and one stakes winner. NOCTURNAL (1923), was a decent juvenile, winner of the Queen City Club Stakes at age 2, one of four wins in his ten starts. XALAPA CLOWN (1936), was bred by Simms, who had an interest in his dam's sire, My Play (Man o' War's younger brother), and had several My Play daughters in his stud, including the non-winning Loma Linda. Her third foal by Eternal was Xalapa Clown, winner of all three races at age two for Simm's daughter, Bessie Franzheim, including the 1 mile-70 yard Ardsley Handicap, in which, carrying 122 pounds and in the fast time of 1:45 he beat the good filly Ciencia (who later beat him into second in the Santa Anita Derby). Of Eternal's fillies, his best on the track were NO REGRETS (1924), winner of fourteen of her 35 starts, including the Joliet Stakes at age two, and ROSE ETERNAL (1925), who had a very short, but brilliant career as a juvenile, wining the Aberdeen Stakes and the Pimlico Nursery Stakes in her five starts. Rose Eternal later was the dam of Eternal Bull (1939, by Bull Dog), winner of the Myles Standish Stakes and two other races. Fair Perdita was the dam of the top juvenile Requested Two Eternal daughters were immediately successful in the stud. MANY THORNS (1925) had three starts in two years, and won nothing, but she got two stakes winners; her gelded colt, Many Stings, by obscure sire Canaan ran 61 times, and won fourteen races, including the McLennan Memorial Stakes and the Widener Handicap at age five. Her other stakes-winning son was Marfeu (51934, by Pot Au Feu), who won 12 races in 136 starts, including the John Schank Memorial Handicap at age five. Eternal's daughter FAIR PERDITA (1932), a winner of two minor races in fifteen starts over two seasons, produced the excellent juvenile runner Requested (1939, by Questionnaire), who would have taken championship honors at age two, had not Alsab surged in the fall of that year. At age two he won seven stakes, including the Youthful, Wakefield, Great American, and Cowdin. He was also good at age three, but sore and lame after the Preakness (dead-heating for third), he was taken out of training for the remainder of that season; earlier in it he had won the Flamingo Stakes and the Wood Memorial, and placed second twice in his eight starts. He was brought back at age four, his only stakes win the Chalmette Handicap. He was a popular sire, and moderately successful, with 17 stakes winners. There are always questions about promising racehorses who never quite achieve what may have been their potential. There was frequent speculation regarding Eternal's capabilities as a runner, since he fell lame so early in his career, and never fully recovered from it. The speculation continued regarding his stud career, where he was so underused, and generally bred to mares with few racing credentials of their own, but still managing to get a number of long-running winners.